A grief reversed. A hope deferred. 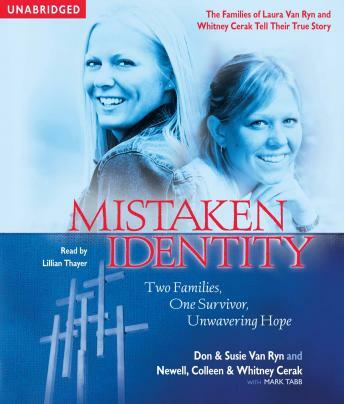 Mistaken Identity tells the unprecedented story of Laura Van Ryn and Whitney Cerak: one buried under the wrong name, and the other in a coma being cared for by the wrong family. Five lives were lost in a tragic car accident, and the sole survivor was rushed to the hospital, where she remained in a coma for five weeks. Everyone believed that Laura Van Ryn was in a coma, and that Whitney Cerak had died in the crash—until Whitney woke up. This shocking case of mistaken identity stunned the country and made national news. Would it destroy a family? Shatter their faith? Push two families into bitterness, resentment, and guilt? In Mistaken Identity, the Van Ryn family and the Cerek family describe their ordeal and explore the bond sustaining and uniting them as they deal with their bizarre reversal of life lost and life found. Mistaken Identity weaves a complex tale of honesty, vulnerability, loss, hope, faith, and love in the face of one of the strangest twists of circumstances imaginable.